Sizing can be a challenge when you are buying your wedding band online. If you don't already know your size, you need options for that. Don't guess or go by your shoe size that rarely works. Don't download a paper sizer we don't have much luck with that method either. The two best options are: being sized professionally by a jeweler or finding a ring that fits and find out the size. Best bet is to go to an independent jeweler. All of our rings are comfort fit and sized to the center so you should be sized for center sizing. The jeweler will most likely use a key ring of gauges or individual gauges that are about 6 mm wide (see image A) and the sizes are written on them the - indicates the 1/2 size (see image B). Try the gauges on until you find the one that fits best. You don't want it too tight be sure you can put the gauge on and off without too much difficulty. Try the next gauge up and next gauge down just be sure they have the gauge checked on a mandrel (image C). The mandrels are all standard but I have seen slight variations in the gauges so they should be checked. 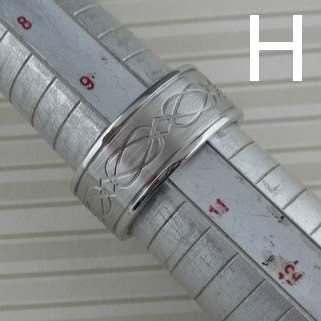 A good way to double check is to try on some rings and check the sizes on a mandrel. A few examples image F is a 5.5 mm domed profile ring and is a size 9; image G is a 9 mm square profile ring and is a size 9 (note the square ring is nearly 4 mm wider and the center of both of these rings falls at the 9); image H is a 10 mm wide flat profile ring and is a size 10. Most rings are available in a 1/4 size. Just ask. Narrow engagement rings or rings that are tapered will be different from your band size.